The world lost a beautiful soul yesterday. Not only was Prince one of the greatest musicians of our time, he was a long time vegan and animal rights activist! 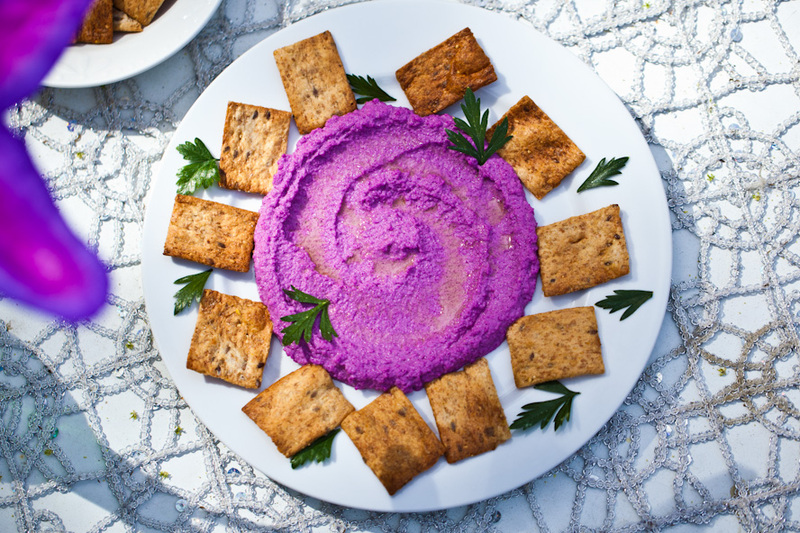 So in honor of Prince and his love of purple, we present Raw Purple Cauliflower Hummus. 🙂 It won’t bring Prince back, but we think he would appreciate it. Put on your favorite Prince song and eat this Purple Raw’n Cauliflower Hummus while dancing and celebrating his life! NOTE: This will stay fresh in the fridge for 1-2 days. To keep the hummus purple, cover it with plastic wrap before storing in an airtight container. If you like this recipe, check out our Green Goddess Parsley Superfood Hummus and our Vegan Crab Cakes. They are soooooo good! Also we made a fun, funky video for this hummus! Check it out below! Isn’t raw cauliflower going to cause some trouble though??? I think I’m going to try it lightly steamed!! Thanks for this . I’m on day 25 of my 30 day Rawsome April. And The purple rocker IS my favorite artist! Wow! How did the 30 days go for you? I’m about to go on a 30 day raw adventure and would love to talk to you!